How to Use GPS without Any Distraction during Driving? A GPS is a device made for our ease while driving, but this same device could prove to be a danger for us, if not used safely. The dangers of using GPS while driving, holds the same risks as that of texting and eating behind the wheel. Many people have admitted to losing focus on the road while they are involved in studying the map of their route on the screen. The trouble with these devices lie in the fact that they make us lose our focus and cause us to take our eyes off the road and this is when accidents happen. Any task that directs our attention away from the road, poses a similar threat. According to the studies, the risks associated with GPS increase significantly when a driver has to enter an address into the system while on the road. But surely, a lot of research was put into engineering a GPS and which is why it was created using the easiest input options that pose the least risk to the driver. This is why, after seeing the safety risks in manual devices, most new GPS systems come with a voice input method that doesn’t require one to take their eyes off the road at all. This is great news for people who have yet to buy GPS systems, but not for those who already own manual input devices. Fortunately, there are some great safety tips that a manual device user could exercise in order to use a GPS safely. Read on for these tips. The first tip is the most important one of all. Do not input anything in to the navigation system while you are on the move. Always ask the person in the passenger seat to read out the routes for you. 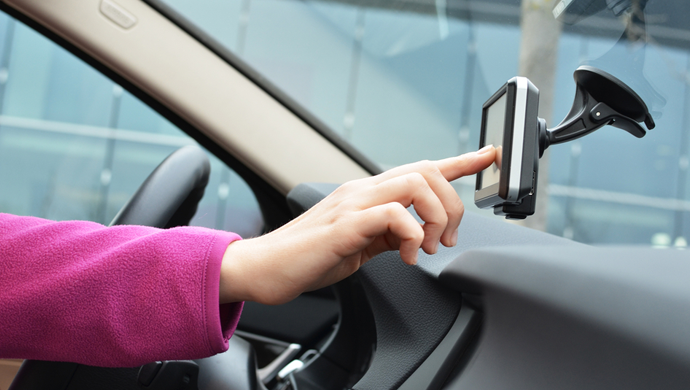 Mount the device below eye level on the windshield, so that you don’t have to look very far or strain your neck to glance at the device. Familiarize yourself with the route before setting out on the journey, so that you just have to look at the screen, a few times only. Make maximum use of the navigation system, while waiting in traffic. Keep the audio volume to a level that will not block out traffic noises and at the same time will be easy to hear over noises as well. Make sure to check and adjust all settings before you set out on the road. Choose a view option that is easiest for you to comprehend while driving. Adjust this before you start driving. It is best to get used to the voice guidance from your GPS instead of glancing repeatedly at the screen, but make sure you use driving sense instead of blindly following orders given out by the GPS system. For example do not take a right turn, if your GPS tells you when you can see a wall blocking your way to your right. A GPS System is made for your convenience and hence, it is a great device when driving in a new city but make sure it doesn’t turn into a problem instead of a solution for you.